Faster than a Speeding Bullet, Crap with Girls: After a freak meteor storm turns postman Bob into a superhero, he must face his greatest challenge: going on his first date in six years. 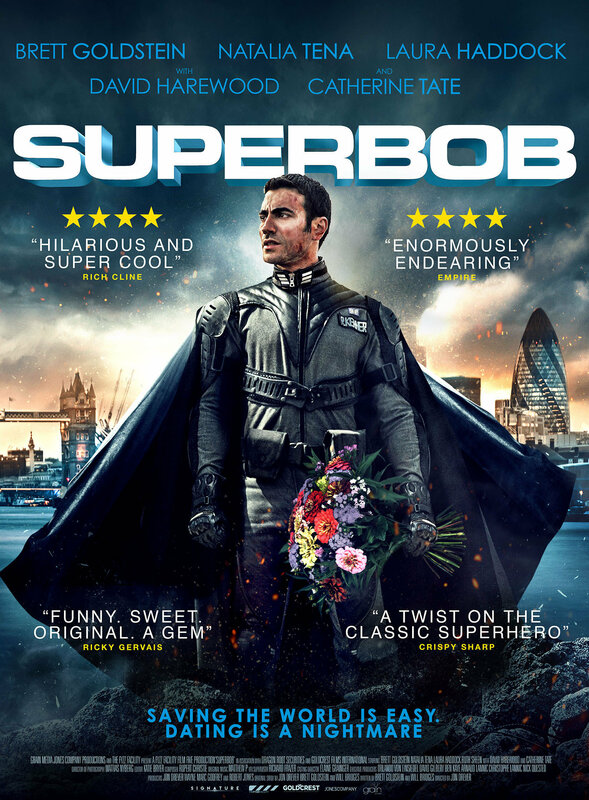 Featuring stellar support from top tier comedic talent, Bob must balance international politics, saving the world and getting the girl. Robert Kenner is a lonely man looking for love. Today, if he can actually get his boss to give him some time off, he is going on his first date for 6 years. Oh, and he is also the world's only SuperHero. A low budget superhero romance movie that is actually endearing and highly watchable. Maybe it's the awkward interactions dealing with a awkward superhero, but I enjoyed watching the characters and the direction of this low budget movie. So the plot is about a postman that gains super powers after getting hit by a meteor. But the thing is, the guy is super socially awkward but a very likable and friendly guy. So the movie is about him dealing with his average daily life despite him being super awkward and having super powers. The thing is, socially awkward people or people that have trouble interacting with someone they really like or people that are a bit of a introvert will probably find the character Bob to be relatable. He is far from being the suave, cool and charming Batman/James Bond type of hero. Despite the awkward comedic elements that is the main driving force of this movie. Where you can have the looks or the money or the most genuine and good intentions, but just has a difficult time with the woman or the man you have a big liking to. If your an audience member that just wants to see some superhero action, you will leave disappointed. They just didn't have the budget for that. But if you want a movie with likable protagonist and endearing awkward humor you might enjoy this one. This movie sort of reminded me of the movie "Hancock" in some ways, but I liked this one more. Despite the limited budget and the very short running time. It's actually a enjoyable independent film that is worth a watch. 7.1/10 If you are expecting typical superhero flick laden with special effects, one in which the protagonist is cocksure of himself and knows what to do, says smart one-liners and saves the day... then this isn't the flick you would enjoy... Maybe that's why this one has got such a low score on IMDb. For me, it was a perfectly paced love story, which happens to fall in superhero genre. It's a slower paced rom-com which might not be suitable for everyone's palate. The ending is sweet, and does not preach any message (good over evil etc etc) but is more about finding love, and working up the courage to admit it.While an extremely polite superhero who gets lorded over by everyone, even an old lady might not make you admire him, but the way his politeness earns him goodwill as a dividend in the end makes you reconsider your opinion. All in all, a sweet short movie which deserves much better ratings than it currently holds... and maybe, a sequel.